Every day is a stinkin’ day now. Let’s pick a date at random: May 12. According to NationalToday.com, May 12 is National Limerick Day and World Migratory Bird Day. How about August 4? National Chocolate Chip Cookie Day, National Mustard Day, and U.S. Coast Guard Birthday. Today is International Day For Tolerance, National Button Day, and National Fast Food Day. So, naturally, here are all the deals on buttons and tolerance available to you. The thing is, a lot of these offers aren’t... great? Like, they’re not terrible—well, some of them are—but there’s really only one that’s legitimately excellent, and that one started earlier this month and goes through the end of the year. As such, we’ve made some notes. Forgive us, we’re a little cranky, and don’t think $1 french fries are anything to write home about, McDonald’s. 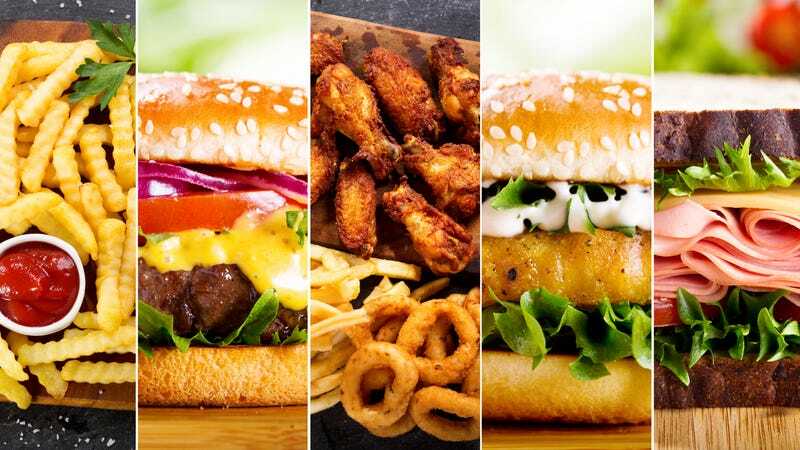 This is a partial list, of course—there’s so much fast food, we couldn’t possibly include every chain—compiled from roundups courtesy of Treasure Coast Newspapers, Delish, and BGR. We’ve broken them into four self-explanatory categories. The deal: The Wendy’s Frosty tag is still on sale. Pros: It is a very good deal for very cute tag supporting a very good cause. The deal: Until November 23, get a free Jr. Bacon Cheeseburger with any purchase, redeemable through the Wendy’s app. Pros: The offer resets daily, so if you want, you could buy one order of fries a day for a week and get a free burger every time; even though it doesn’t break the bank (it’s usually $2.09), a free burger is still a free burger. Cons: Free with purchase, while standard, isn’t exactly free; you have to download the Wendy’s app and probably hand over your email and other dumb stuff. At least they don’t need your social security number... or do they? The deal: Through November 20 (or until the cap is reached), the creator of our favorite fast food sauce is giving away 200,000 chicken sandwiches to people who place orders through DoorDash in celebration of that new mutually beneficial arrangement. Pros: Only a $5 minimum order, which means it could honestly just be for your lunch; only requires using the code CFADELIVERY, rather than downloading an app. The deal: You can get a Quarter Pound Double Stack Cheeseburger and a medium tots order for $2.99, limited time only blah blah blah. Pros: Decent discount; good through the end of the year. Cons: None of it’s actually free; does not include a beverage of any kind, and isn’t that sort of the whole appeal of Sonic? The deal: Three pancakes for 89 cents at “participating restaurants” during breakfast hours only; DoorDash is waiving delivery fees for Burger Kings in Los Angeles, also during breakfast hours only. Pros: I guess if you really like BK breakfast and live in L.A., that ain’t bad. Cons: You think we don’t know that those pancakes cost you like two cents to make, tops? Also, how good could fast food pancakes possibly be when you have to wait for them to get delivered, should you happen to live in Los Angeles? See also: Chick-Fil-A, emails until death. The deal: It’s not really a deal so much it’s a limited time thing—the chain is offering Red Stick Chicken (i.e., chicken marinated in “Tabasco pepper marinade”) for $5. Cons: Not actually a deal, but at least they’re upfront about it. The deal: Get a free medium curly fry with the purchase of a large Coke Freestyle when you sign up for the company’s mailing list, today through Sunday. You could also fork over your phone number for a coupon-by-text. Pros: Fries are good and free is good; a soft drink isn’t a huge purchase. Cons: Emails and texts until death. The deal: You can stroll into a “participating location” from 10 a.m. to 2 p.m. today and tomorrow for a 4-ounce iced latte sample. Then, from November 19-25, medium lattes and cappuccinos will be $2 all damn day. Pros: In Dunkin’s defense, a sample is actually totally free. Cons: No, I don’t want a sample, thanks, I am trying to get to work on time, can I please just have my coffee? The $2 deal ain’t bad, but it is not occurring on that most venerated of days, National Fast Food Day. The deal: We’re just going to take this one verbatim from Treasure Coast: “Through Dec. 2, pop a balloon on the McDonald’s mobile app for the chance to win a deal in the chain’s Pop-a-Deal promotion. Plus, find other coupons on the app.” Oh, and you can get $1 fries, also through the darned app. Pros: Uh, maybe you win something? Cons: I’m sorry, if I’m going to get an offer I totally won’t use for the satisfaction of doing a meaningless activity, I’ll wait until the Monopoly game comes back.